This crowdfunding project has ended, but you can still support the Fletcher Conference on Gender and International Affairs. Thank you for your continued support! Welcome! We invite you to support the fourth annual Conference on Gender and International Affairs at the Fletcher School of Law and Diplomacy at Tufts University. The conference is completely student run, and we rely on the generosity of those like you to provide a free public conference to our community. With your support we can achieve our goal of creating an interactive and intellectual space to cultivate knowledge and conversations on the relevance of gender in all areas of international affairs. Each year, the prestige of the conference has grown, allowing us to attract the highest caliber of speakers and panelists. The donations we receive ensure we can invite the most talented individuals in the field of gender and international affairs and provide a valuable and unique opportunity for personal and professional growth for students and professionals alike. 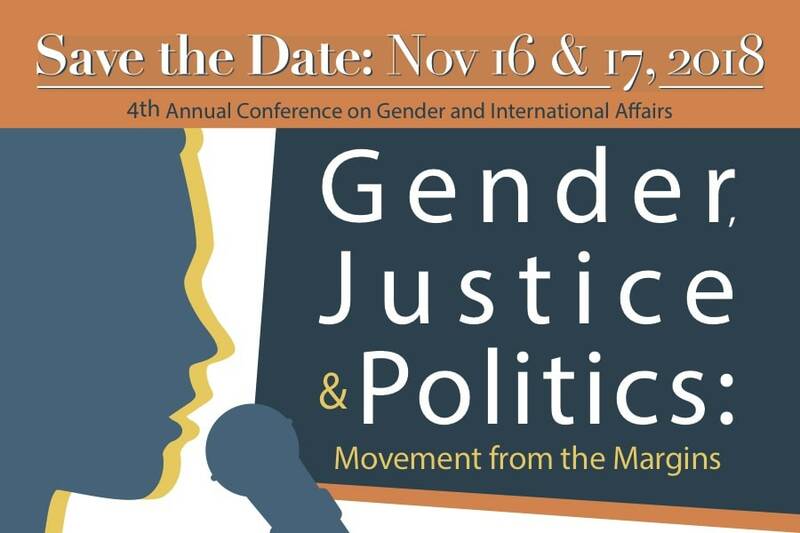 This year’s conference theme, Gender, Justice & Politics: Movement from the Margins, expands upon the previous three conferences by broadening the application of a gendered lens from the individual to states and institutions and by exploring the role of gender in global issues. The goal of this year’s Conference on Gender and International Affairs is to facilitate conversations about gender and power, with a particular focus on the ways in which communities are marginalized and how they challenge the status quo. This year’s Conference is will also introduce a gender lens to professional fields and sectors from which it has been traditionally absent or ignored. The panels will be supplemented with an in-depth conversation on gender in the midterm elections, workshops about mentoring, and political organizing. Ultimately, we intend for participants to leave the conference with a greater, more nuanced understanding of intersectional gender analysis and as advocates for gender sensitivity within their fields of work. We thank you for any contribution you can make, and hope to see you at the conference on November 16th and 17th at The Fletcher School. Thank you for supporting the fourth annual Conference on Gender and International Affairs at the Fletcher School of Law and Diplomacy at Tufts University! Food brings people together. Help foster that sense of community and provide students an opportunity to network by providing lunch and coffee break refreshments for guests and panelists. All of our panelists are donating their time to the conference. Help us show our appreciation for their willingness to volunteer their insight and expertise! The conference aims to engage the topic of gender and international affairs through multiple mediums and methods. Support our effort to provide the space for artistic expression. Sponsor a conference breakout session to enable attendees to engage in an intimate, nuanced conversation on gender and international affairs. Help us ensure that we can bring the most diverse, experienced, and knowledgable group of experts to the conference to engage in a rich, challenging, though-provoking conversation.